Hi Everyone! I have a fun project for you today that I've been working on for awhile. The kind people at Art Resin sent me a sample kit of their resin to work with and I wanted to try something a little bit out of my box with their product. 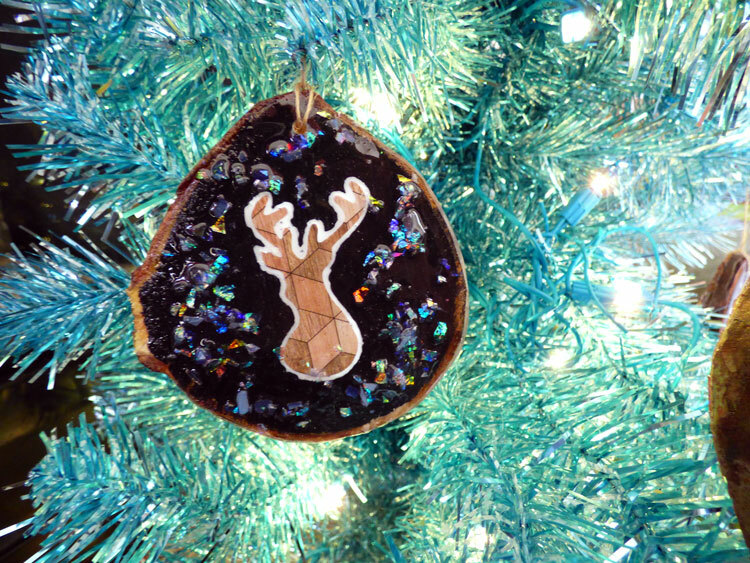 This isn't the first time I'm sharing my DIY Wood Slice Ornaments but I wanted to show you how beautiful they look with this resin on top! This was the first time I have ever worked with a resin and I will admit to be a bit nervous but there was no need to be. The product is very simple to mix (1:1) and pour. My favorite part was that there was absolutely no odor and I could easily blow the air bubbles away with a straw. Seriously, easy peasy! 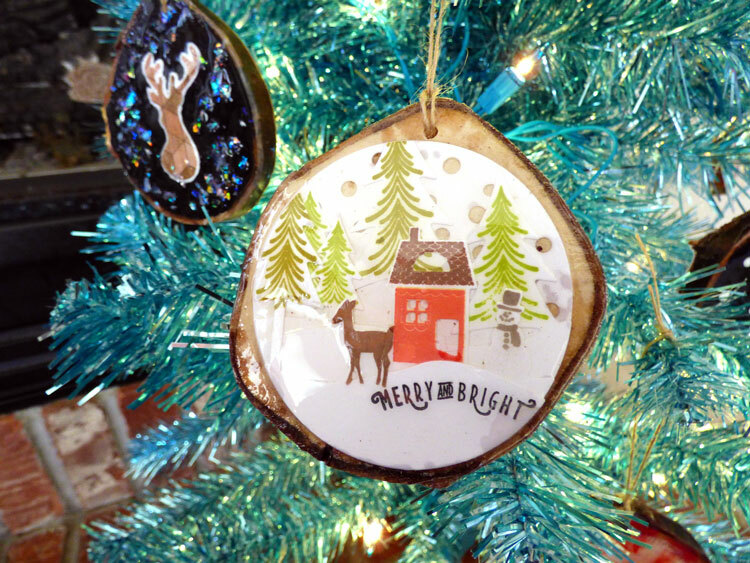 My wood slices come from our past Christmas tree (we always get a real tree) and this is such an awesome way to up cycle that purchase once the season is over! 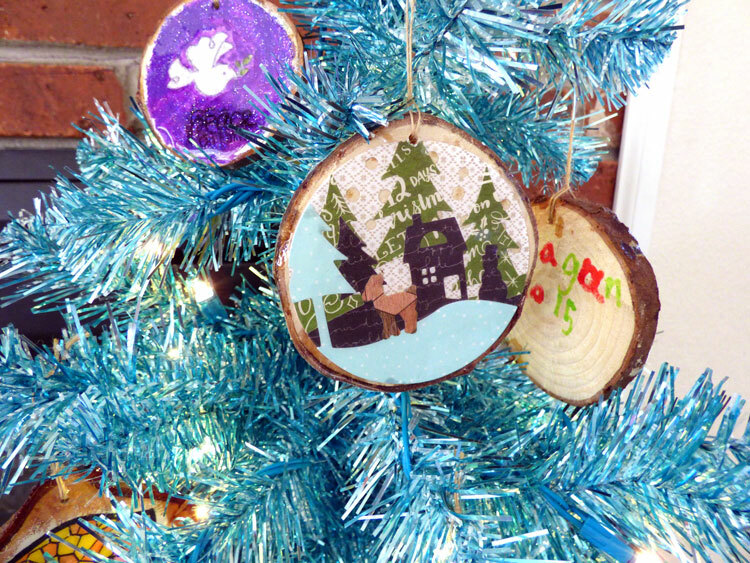 However, you don't need to go cut down a tree for this, many of the craft stores carry wood slices in many difference sizes now that you can decorate to your hearts content! For this one (above and below) I used a PaperTrey Ink Die (I can't find it on the site now - it was from last year's release but there are many more designed by Betsy Veldman that would work just the same) and cut out many layers from different pattern papers. These two are my hubby's favorites. This one was inspired by my good friend Valerie who created the most beautiful THIS beautiful set of cards. I love the Art Resin over top this stain glass look. 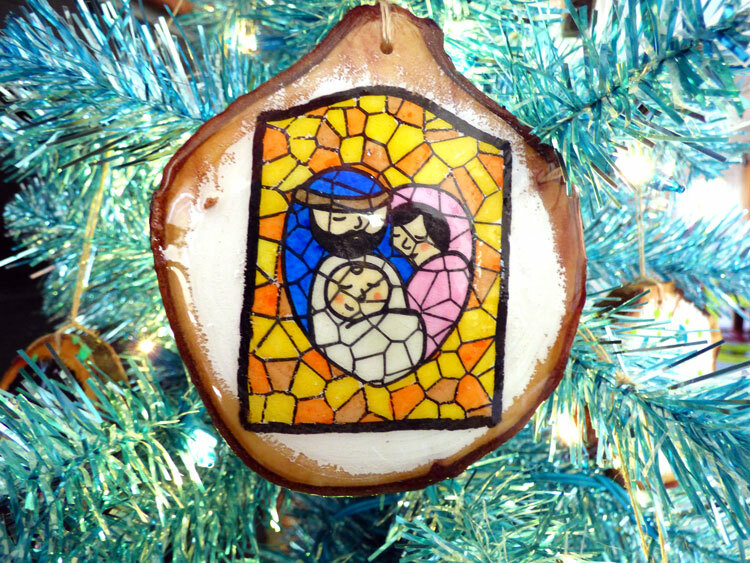 It is one of my favorites using the Paper Smooches A Blessed Christmas stamps with the DRS Designs Arched Stained Glass stamp over top. I used Faber-Castell Design Memory Craft Big Pitt Artist Pens to color the image. 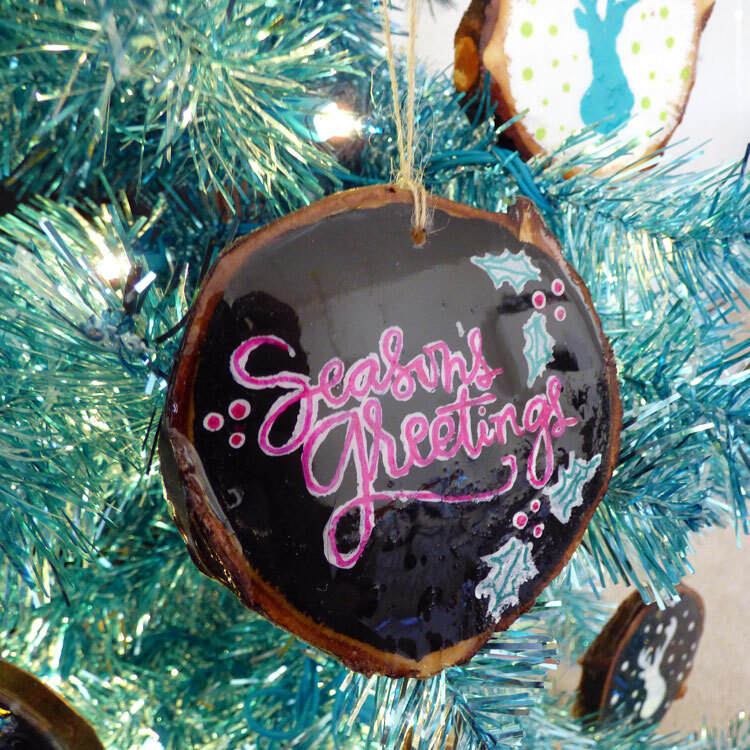 This one is very simple - I painted black chalkboard paint on the ornament rather than white gesso and stamped with paint the sentiment from Simon Says Stamp Big Scripty Holiday Greetings. I used Faber-Castell Design Memory Craft Metallic Pitt Pens to accent everything and free hand drew the holly's. For the next two (above and below) I used the WPlus9 Stag Trio die. For the one above, I die cut the pattern paper and adhered it to the wood with gel medium. For the one below I used the negative of that cut as a mask and sponged the wood with white paint. I love them both and they were so simple! 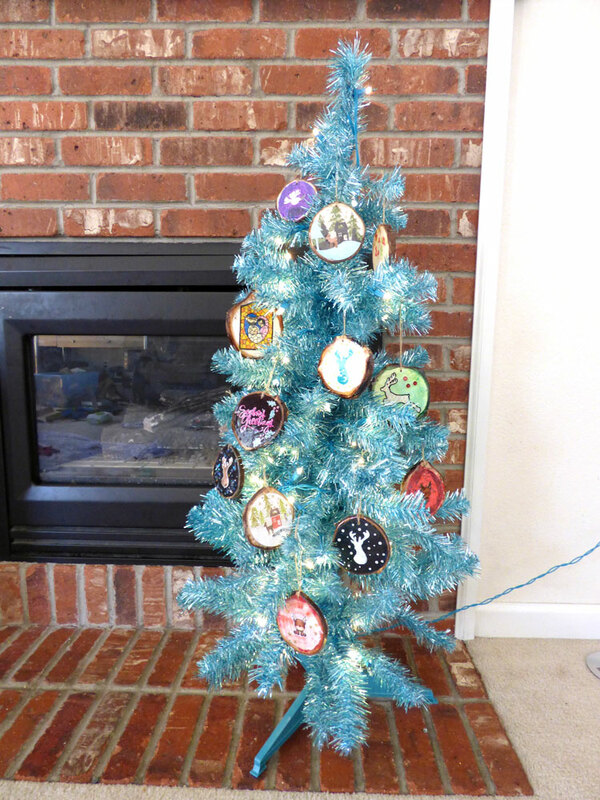 Here they all are on my fun little blue Christmas tree! 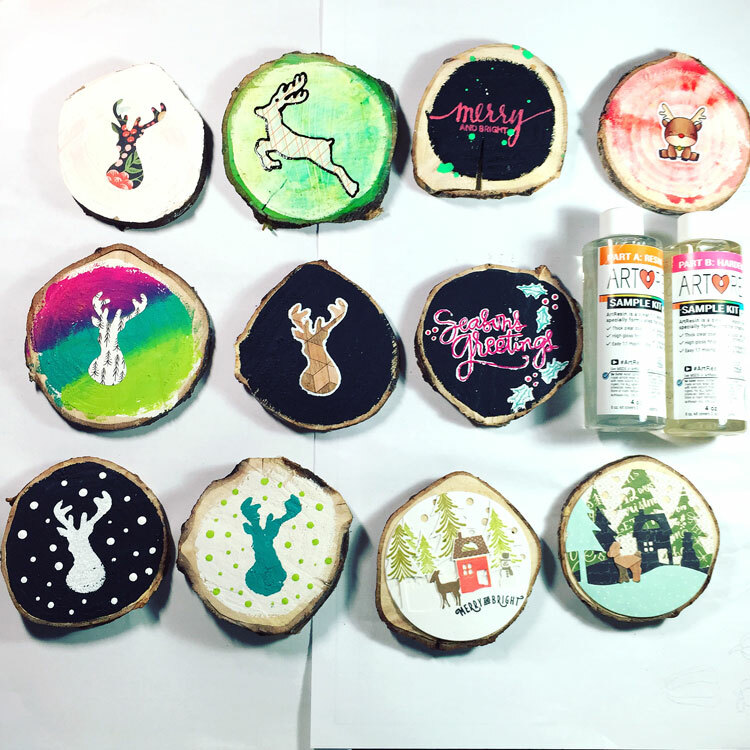 I absolutely love seeing them all together and you can see my kids created a few of their own because it is so fun making these DIY Ornaments. 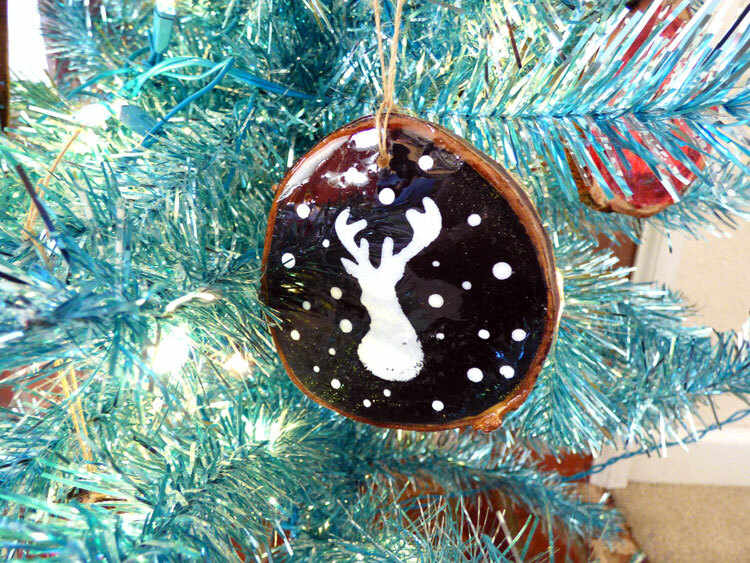 I poured the Art Resin on theirs as well and they made wonderful keepsake Christmas gifts for the grandparents this year. How sweet! If you are new to using resin, I highly recommend Art Resin: it's safe, clear, simple and beautiful. I love how pretty all our ornaments look on the tree and I know they are protected for years to come and won't yellow with time. To learn more, they have an awesome Video Section on their website. I'm thrilled I was able to work with this amazing product. What a beautiful tree with those AMAZING ornaments! Absolutely stunning project!! I would NEVER think to make those; I just love them!